My fellow Singaporeans, the PAP has a bigger objective beyond discrediting the Workers’ Party over the town council issue. That objective is to break the will of the people who want to see real change and more opposition MPs in Parliament to check on the Government. I am sure the same thing will happen again to another opposition party in the future. The PAP wants you to believe that they are the only chosen one who can run Singapore. The Prime Minister had this to say about voting for opposition to check on the government. He said, “For every one more “checker” in parliament there will be one less doer, thinker and leader in the government to serve the nation and the people.” Basically, the PM is saying all the PAP MPs are indispensable. My fellow Singaporeans, the PM is saying – no PAP equals no progress and no future for Singapore. So your children may be studying for a diploma or degree now but they will have no progress and no future if the PAP is not in power. Let’s give the Prime Minister the benefit of the doubt because his colleague forgot to tell him about the story of the “haolian” rooster. I don’t know what kind of chess the PM is playing but the checkmate will not be on Singapore. No party can be bigger than Singapore. This is what happened when you let a despotic regime run loose for 50 years. It began to think it owns Singapore. By the way, the PM has confirmed that your PAP MPs are doers and thinkers and are not going to check the government for you. If you vote for the PAP, you will not have a voice in Parliament. Even if the PAP MPs want to check on the Government, it will not work. One thing I learned as Chairman of the Audit Committee at AHPETC is you can’t check on yourself. You will fail audit. 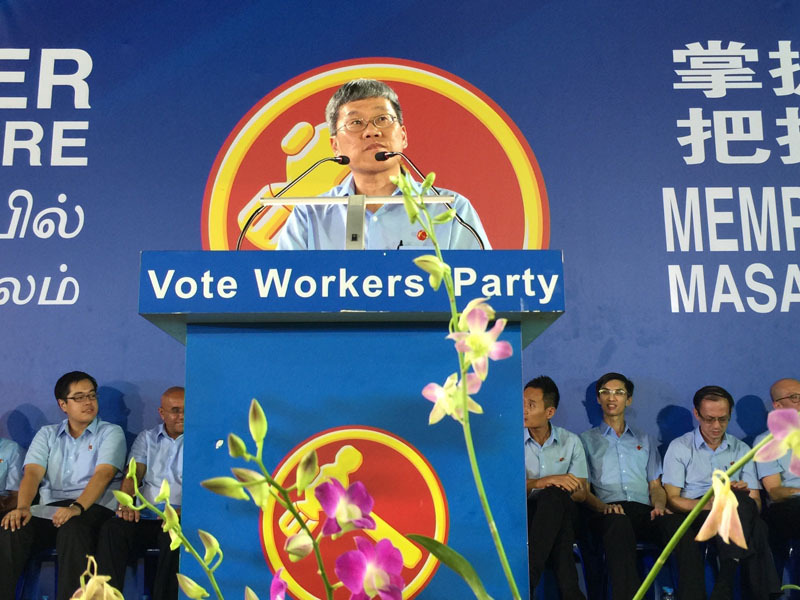 There is only one way to check on the Government – vote Workers’ Party! I met a friend from Thailand right after the military coup in May 2014. I asked him about life in Thailand with all the political turmoil going on. He said the civil service in Thailand is good so things are running. Although business is affected, life goes on. I am sure DPM was not talking about the importance of having good political leadership in general but he was implying that the PAP should be the chosen one to lead Singapore forever since the subject was about revolving door politics. Well I like to assure the DPM that if the PAP were to lose power one day, he can go home and take a hot bath because the water will still be running. He can read the newspapers and serve the internet because the electricity will still be running. And he can take the MRT and buses to work and cross the road safely because everything will still be running. And the birds will still be singing and they will be singing a new song, a song of freedom. My fellow Singaporeans, you have given the PAP an amazing slap on the face not too long ago. But instead of knocking the PAP unconscious, you have actually knocked the PAP conscious! It became conscious about the long wait for HDB flats. It became conscious about the high prices of public housing. It became conscious about the elderly poor. It also became conscious about Singaporeans becoming a minority in some companies due to misguided foreign talent policy. The PAP made many policy U-turns after 2011 but a PAP minister said many of the government policies introduced after 2011 were developed a long time ago with some as far back as during the late Mr Lee Kuan Yew’s time. Dear voters, it does not matter how the policy U-turns come about and the Workers’ Party is not claiming credit. It is the people of Aljunied, Hougang, and Punggol East who should get the credit because they gave the PAP seven tight slaps that made the difference. Imagine what 28 slaps can do? It is important for us to think about what this General Election holds for the future. In 50 years of nationhood, one party completely dominated the political scene because we, the people, gave that party too much power. But what we have given, we can take back! And we will and we must for the sake of our nation. The PAP deserves no respect from the people because it never respected your choice of elected Members of Parliament in the first place. Your Workers’ Party MP can never set foot in the community clubs or host an event there as the elected MP of the constituency. On the other hand, the PAP MPs are given staff hired by People’s Association to help them run their constituencies. They get to use the Community Clubs for events as Grassroots Advisers, all paid for by the people’s money. In fact, the PAP government makes Grassroots Advisers so important that their magazine would address them as Grassroots Advisers first then follow by their appointment even for Cabinet ministers. This is basically to legitimise the use of public fund for political mileage. I only have 3 words for the PAP – Shame on you! We have come a long way. Today, the PAP does not dominate the political talent pool. And today, the people have found their collective empowerment to effect change. To the people of Aljunied, Hougang and Punggol East, I salute you! To the people of Nee Soon, East Coast, Fengshan, Marine Parade, Macpherson, Sengkang West, and Jalan Besar, we need you to send a clear message too. We need your support in our march towards a first world parliament because we need to have our Singapore back and we need to do it now! The longer we wait, the more the PAP will manipulate the system to suppress the growing opposition voice. For so many years, the PAP says they know what’s best for Singapore and without them Singapore will fail and your wives will be maids in other countries. I don’t know what the PAP knows best but they know best to price HDB flats that will take you a whole lifetime to pay. They know best to keep you working your entire life because your CPF is never enough to meet the minimum sum. They also know best to give your children a world best education but they leave them fighting for jobs with foreigners. And they know best to pay themselves the highest salaries for political office but they will say the salary formula was debated in Parliament. By the way, we are outnumbered 80 to 9 in Parliament. They can pass bills in House even with half of their MPs on holidays. There are only two possible results come September 11. We either go back to the dark ages of politics in Singapore or we empower ourselves to stand up against tyranny and arrogance. Values like justice and equality are trampled upon by the PAP with impunity and we cannot let it go on for another day longer. My fellow Singaporeans, the time has come to make a change, a big change, a 28-slap change. In Hougang, I have attended one too many funerals of my elderly residents who did not live long enough to enjoy a simple lift ride to their homes because of bad politics. We cannot let the PAP play with our lives ever again. The time has come to empower your future.